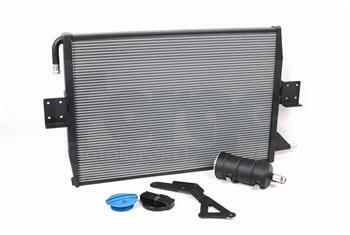 The Forge Motorsports all alloy radiator is a direct replacement. With the known continuing problems of OEM radiators where the plastic end tanks can crack or leak from their joints, an all alloy fully welded and braised radiator has to be the solution. Our proven construction techniques, using one of the best cores available with alloy end tanks, provides increased longevity and you are no longer waiting for the inevitable failure. Whether your spending time on the track, use your vehicle in a warm climate or simply want to reduce those high temperatures when caught in traffic, this has to be a worthwhile purchase. All the mounting holes for the fans, including those required for vehicles with air conditioning are pre-drilled to ease installation.